Zachary John Quinto (born June 2, 1977) is an American actor and producer. Quinto grew up in Pennsylvania and was active in high school musical theater. In the early 2000s he guest starred in television series and appeared in a recurring role in the serial drama 24 from 2003 to 2004. In 2006, Quinto acted in the sitcom So NoTORIous and portrayed series antagonist Sylar in the science fiction drama… Heroes from 2006 to 2010. He was cast as Spock of the Star Trek franchise and appeared in the 2009 reboot Star Trek. He will continue the role in the 2013 sequel. 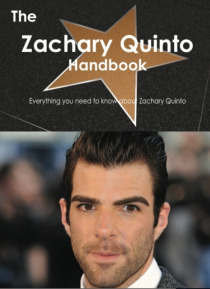 This book is your ultimate resource for Zachary Quinto. Here you will find the most up-to-date information, photos, and much more. In easy to read chapters, with extensive references and links to get you to know all there is to know about his Early life, Career and Personal life right away. A quick look inside: Zachary Quinto, Off Centre, Minor government agents in 24, Joan of Arcadia, So NoTORIous, Heroes (TV series), Robot Chicken, Star Trek (film), Margin Call, Girl Walks Into a Bar, What's Your Number?, American Horror Story, Untitled Star Trek sequel.